#1 New York Times bestselling author Dean Koontz is at the peak of his acclaimed powers with this major new novel. The city changed my life and showed me that the world is deeply mysterious. I need to tell you about her and some terrible things and wonderful things and amazing things that happened . . . and how I am still haunted by them. Including one night when I died and woke and lived again. Here is the riveting, soul-stirring story of Jonah Kirk, son of an exceptional singer, grandson of a formidable “piano man,” a musical prodigy beginning to explore his own gifts when he crosses a group of extremely dangerous people, with shattering consequences. Set in a more innocent time not so long ago, The City encompasses a lifetime but unfolds over three extraordinary, heart-racing years of tribulation and triumph, in which Jonah first grasps the electrifying power of music and art, of enduring friendship, of everyday heroes. The unforgettable saga of a young man coming of age within a remarkable family, and a shimmering portrait of the world that shaped him, The City is a novel that speaks to everyone, a dazzling realization of the evergreen dreams we all share. Brilliantly illumined by magic dark and light, it’s a place where enchantment and malice entwine, courage and honor are found in the most unexpected quarters, and the way forward lies buried deep inside the heart. 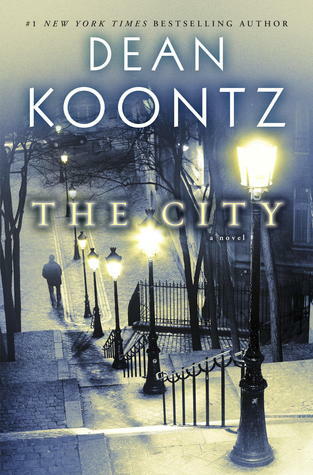 I used to read Mr. Koontz all the time but after a while the stories felt like they changed from his earlier stories. This story is a look at life in the big city any city, this story just happens to take place in New York City and is being told by Jonah. He describes for his life growing up and the few people that are in his life daily. Music is also important part of this story and gives a nice back ground. But the main story takes place in the 60s and growing up in that period it interesting now how many people are writing about that time, the music, the war, the protests, there was so much going on when you look back it brings you back to that time. One part was from 1967 when Apollo 1, when the crew was killed in the fire of the cabin of rocket. He goes through his own tragedies and other points from the 60s and then takes you to the day that changed his life and his friend’s life forever. This is a story of happiness at times and of loss and sadness and for what those were like and for some of the people who severed at the hands of others all of this happening in the 60s you looking at it through the eyes of a young boy being told by now a man being taken back to that time and reliving it through the telling of it through his story the city. Each city, each pair of eyes being different. A very well written book, I enjoyed it a lot. I got this book from net galley.